Crest of a Knave is the sixteenth studio album by British rock band Jethro Tull, released in 1987. The album was recorded after a hiatus of three years occasioned by a throat infection of vocalist Ian Anderson. After the unsuccessful Under Wraps, the band returned to a more heavily blended electric with acoustic style of sound, one of the top characteristics of Jethro Tull. The album was their most successful since the 1970s, and the band enjoyed a resurgence on radio broadcasts, appearances in MTV specials, and the airing of music videos. It was also a critical favourite, winning the 1989 Grammy Award for Best Hard Rock/Metal Performance Vocal or Instrumental. The album was supported by "The Not Quite the World, More the Here and There Tour". Even though Doane Perry had been a member of Jethro Tull since 1984, several tracks still featured drum machine instead of a live drummer. Keyboardist Peter-John Vettese was also absent and it was Ian Anderson who contributed the synth programming. The album sleeve only lists Ian Anderson, Martin Barre and Dave Pegg as official band members. Barre remembers of this production as being "the album where a lot of things were of my invention. There are still chunks of the music where lan very much knew what he wanted, but I think my input was far greater on that album than on any other". The cover was designed by heraldic artist Andrew Stewart Jamieson. The single "Steel Monkey" has the cover designed by art director John Pasche. This album was released simultaneously on LP and on CD, but the vinyl edition did not feature the songs "Dogs in the Midwinter" and "The Waking Edge". Both tracks appeared on vinyl as B-sides to the singles. The album back cover shows in the credit that the album were: "Recorded just round the corner from the kitchen in the room behind the door which used to be painted white but isn't any more". And also: "Martin would like to thank Paul Hamer (Hamer Guitars). Ian and Dave would like to thank almost everybody else." The album relied more heavily on Martin Barre's electric guitar than the band had since the 1970s. The style of Crest has been compared to that of Dire Straits, in part because Anderson no longer had the vocal range he once possessed (the result of recent throat surgery). Ian Anderson later stated about the musical style of the album: "'Steel Monkey' was based around a sequencer riff, and it didn't have any flute in it. So it was yet another atypical Jethro Tull song that was a radio hit. By comparison, both 'Farm On The Freeway' and 'Budapest' are very typical Tull songs. 'Budapest' is the kind of song I like to write because it embodies a lot of different nuances which I think are subtly joined together. It sort of moves from classical to slightly bluesy to folk, and it just slips between them and you don't see the stitching." Crest of a Knave explores various themes in its lyrics, as Anderson often does. The song "She Said She Was a Dancer" shows that Tull's frank treatment of sexuality was unabated. The album contains the popular live song "Budapest", which depicts a backstage scene with a shy local female stagehand. "Farm on the Freeway" on other hand, profiles a farmer who has lost his land through eminent domain, and who now possesses only his truck. "Mountain Men" became more famous in Europe, depicting a scene from World War II in Africa and the Falklands War. Ian Anderson referred to the battles of El Alamein (WW II) and also South America (1982), drawing historic parallels of the angst that women left behind by their warrior husbands might have felt. Sounds' review was mixed. It recognized the quality and even called the opening tracks "Steel Monkey" and "Farm on the Freeway" "stunners". The overall evaluation was that: "In a shrewd move, Ian Anderson has studied the current heavy metal renewal and adapted it to suit his own ends, and the results are impressive to say the least". Although in the end, comparing the album with the style of Mark Knopfler, the review would go on to say that: "But in his efforts to stay 'hip', the hairy progressive rock guru has fallen prey not just to the influence of modern pop's more inspiring aspects but also to its foulest evils: the rank odour of Mark Knopfler pervades the remainder of 'Crest...' […] Shamefully and cruelly, the album is snuffed out. It's a pity, in all seriousness". Although contemporarily well accepted, AllMusic's later review was a little more committed, calling the album their best since Heavy Horses, but also stating: "Truth is, it isn't a bad album, with an opening track that qualifies as hard rock and pretty much shouts its credentials out in Martin Barre's screaming lead guitar line, present throughout. "Jump Start" and "Raising Steam" also rock hard, and no one can complain of too much on this record being soft, apart from the acoustic "The Waking Edge," along with "Budapest" and "Said She Was a Dancer," Anderson's two aging rock-star's-eye-view accounts of meeting women from around the world. The antiwar song "Mountain Men" is classic Tull-styled electric folk, all screaming electric guitars at a pretty high volume by its end". The album was a critical and commercial success. It received gold sales certification in the United States, where it peaked at number 32; in the UK, where it reached number 19; and in Canada. It also charted in Germany, reaching number 10. Crest of a Knave went on to win the 1989 Grammy Award for Best Hard Rock/Metal Performance Vocal or Instrumental, beating the heavily favoured ...And Justice for All (Metallica) and critics' choice Nothing's Shocking (Jane's Addiction). The Grammy award was highly controversial as many did not consider the album or the band to be hard rock, and certainly not heavy metal. Under advisement from their manager, no one from the band turned up to the award ceremony, as they were told that they had no chance of winning. 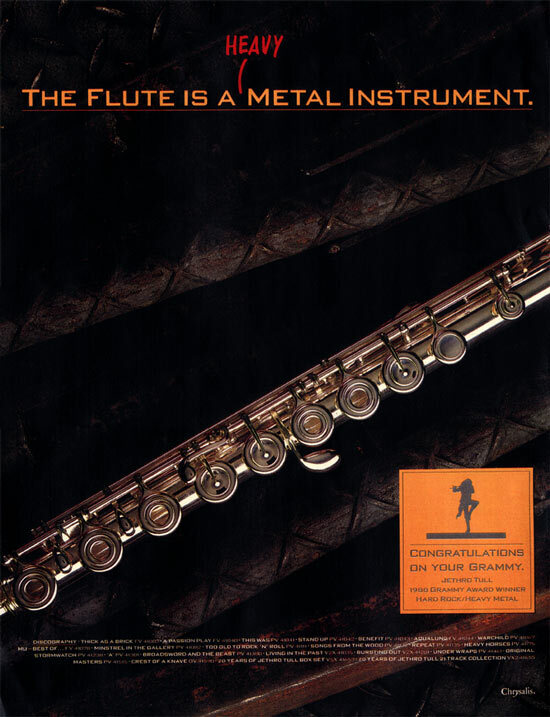 In response to the controversy, the band's record label Chrysalis took out an advert in a British music periodical with the line, "The flute is a heavy, metal instrument!". The Grammy award was split into two categories and renamed after the event. In 2007, the win was named one of the 10 biggest upsets in Grammy history by Entertainment Weekly. The track originally appeared on the 20 Years of Jethro Tull box-set. ↑ "Jethro Tull Press: Guitar Legends, May-June 1997". Tullpress.com. Retrieved 1 May 2015. ↑ "Track listing" (Jpg). Mlb-s1-p.mlstatic.com. Retrieved 1 May 2015. ↑ "Jethro Tull Press: Guitar World, September 1999". Tullpress.com. Retrieved 1 May 2015. 1 2 Bruce Eder. "Crest of a Knave - Jethro Tull | Songs, Reviews, Credits, Awards". AllMusic. Retrieved 1 May 2015. ↑ "Jethro Tull - Crest of a Knave (album review )". Sputnikmusic.com. 23 August 2010. Retrieved 1 May 2015. 1 2 "Jethro Tull Press: Sounds, 5 September 1987". Tullpress.com. 5 September 1987. Retrieved 1 May 2015. ↑ Menconi, David (22 January 2014). "17. Best Hard Rock/Metal Performance (1989): Metal Massacre Photo - 20 Most Awesomely Retro Moments in Grammy History". Rollingstone.com. Retrieved 1 May 2015.